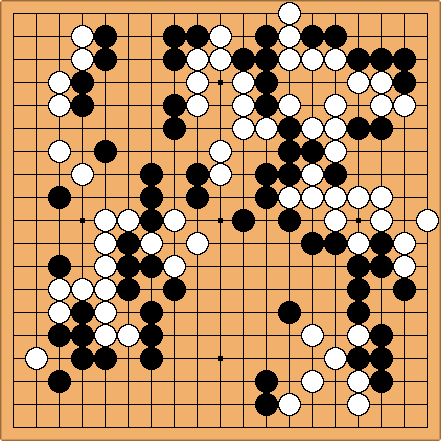 Various musings on my personal experiences with Go. Of course feel free to comment, muse along with me, etc. 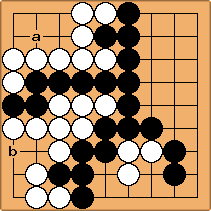 10/28/2004: A goban, to match my stones. 10/28/2004: I hate losing in stupid ways. 10/14/2004: Life and Death. Oh yes, and seki too. We're now firmly ensconsed in our new apartment in Philadelphia, and on the Wednesday before last I attended my first meeting of the Penn Go Society. It was fantastic fun playing real live games for the first time in---I don't know how long. Not sure of my rank, I played even games against a 14k and an 11k and won both. So at the moment I'm assuming that my rank is somewhere around 10k; as I play more games against people in the club I suppose I'll figure it out more precisely. I wasn't able to attend this past Wednesday but hope to go again soon! Recently I have been getting back into playing after a several-year hiatus, mostly due to the fact that I didn't really have anyone to play with. But in the fall I'll be starting a PhD at U Penn and am excited to join the Go club there. I've also started playing some on DGS -- but since my rating was somewhere around 22k I have been winning all my games. So far I'm at 16k and still winning all my games. We'll see how high it goes before flattening out! I just got back from my first Go tournament, held by the Northern Virginia Go Club. I must say, I had a great time! I was pretty happy with my play, but perhaps more importantly, everyone there was really friendly --- it was just a fun atmosphere. I entered as 15k, and ended up with a record of 2-2, which I thought was respectable. In my first game (as black taking three stones), I was ahead by a lot, but then my opponent invaded my large corner and managed to live, which scared me --- but it turns out I still ended up with the victory by about 6 points. I lost my second and third games; in the second one I was simply outplayed, but in the third one I think I could have done better but played like crap, especially in the opening, and ended up resigning. My final game was against a kid who couldn't have been more than ten and who played disconcertingly fast. And while I was thinking he often wasn't even looking at the board. But after I got over being a little intimidated, we proceeded to have a very close game -- he built up a HUGE moyo in the center which I had to invade, but I managed to make two eyes in the center and then proceeded to destroy most of his territory, which was a good thing since I didn't have very much myself. I ended up squeaking out a win by 3.5. But now that I am no longer stressing about proposing, I'm getting back into the game. =) I think next weekend I am going to enter a tournament hosted by a local club. I'm not really sure what to expect, since I've never played in a tournament before, but hopefully it will be fun. Although I am a little afraid that by the end of four 1 1/2-hour matches I will be sick of playing and lose concentration, but I guess that's all part of it. Anyone have any tips on staying focused and alert during tournament matches? Finally, I won some games on KGS! One by almost 40 points taking six stones against a 19k?, and another taking three stones against a 19k, who resigned when I was up by about 50 points. Not all that impressive I guess but a great boost to my confidence nonetheless. In the second game especially I felt I was playing much more quickly and confidently (and with less mistakes!) than in previous games. Now, granted, it's not a particularly difficult life and death problem. (= But it was fun nonetheless. 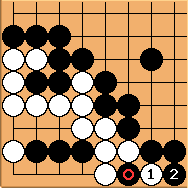 In general I feel like studying tsumego has definitely been improving my game -- not just my knowledge of life and death but more importantly, my reading ability. Yes, you can stop laughing now. 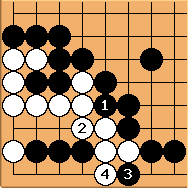 (= What I didn't realize until AFTER the game is that both of White's groups can be killed by Black plays at a and b respectively. Duh. Brent: Actually, I think they are miai. If Black plays a, White loses 5 points and Black gains 23 (14 points of territory + 9 white prisoners) -- a swing of 28 points. If Black plays b, White loses 3 points and Black gains 25 (14 territory + 11 prisoners) -- also a swing of 28 points. So all other things being equal, I think it really doesn't matter. 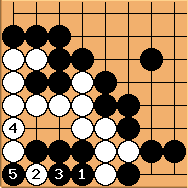 (Of course, in general all other things might not be equal -- in particular I think playing at a instead of b gives White more ko threats -- but in this game there obviously won't be any ko later). Update: ARRRGH! I lost my sixth game by one half of a point! I came back from like 30 points down, too. Guess I need to keep studying my endgame... grr. I thought I did pretty well although I just couldn't compete with his HUGE territory on the bottom. I was also running VERY low on time (I'll have to get used to playing faster games, they're not my strong suit...) In retrospect, though, maybe my group in the bottom right (the result of a botched joseki) could have lived after all, which might have made the game close. At any rate, he built up huge influence throughout the game, and I'm still not good enough (or maybe just too scared) to know how to properly invade or reduce. unkx80: Status of upper right corner - see joseki-related life-and-death example 2. Brent: Aha! Thanks for the link. I'll have to study that one. On a related note, however, I also just had a wonderfully fun and instructive teaching game with Adam Marquis (Makar on KGS), and I think I am starting to get an inkling of some ideas how to invade/reduce large frameworks. Now to test out these new ideas in some actual games! So another one of my students (whose dad is amateur 1d) is going to bring in a cheap set on Friday and maybe we'll do some playing at lunch. Who knows where this will end up going but I'm sure it will be fun! Woman: What game is this you're playing? Us: This is 'go'. It's the oldest board game in the world. Woman: Oh. So, can I buy it at Toys 'R' Us? That made me laugh. Although, I don't know -- can you buy a set at Toys 'R' Us? Anyway, we usually talk a lot, discuss various moves, etc. Our goal is more to learn and produce a beautiful game than to determine a winner and a loser (it's much more fun that way since we're both quite competitive). So we played around 50 moves in two hours, and then decided to continue the game at a later date since we were getting hungry. A very pleasantly spent afternoon! unkx80: Maybe yes -- I have seen those small foldable magnetic go sets sold in toy shops or toy departments, just like those travelling chess sets. Coyote In Canada I have often seen Go sets at those game kiosks in the malls that specialize in board games. Finally, the goban I ordered came, so I have something to do with my stones. =) My little sister is very excited about learning to play so I think we're going to have our first lesson tomorrow afternoon! That should be fun. There are few things I find more enjoyable than teaching others about something I think is beautiful and interesting. Not to mention that one always understands something much better once one has taught it. It's not so much losing that I mind (I am fairly competitive but am trying very hard to take a more balanced approach with go -- to enjoy the game and learn from mistakes, rather than trying to win at all costs). But losing because of silly mistakes, or (in this case) failure to defend a territory that turned out to have a very hard-to-spot weakness, is frustrating and irksome. So I was playing white in a 2H game on DGS. Although my opening was poor, which put me behind, I was able to catch up in the endgame, and with only a few moves left I was (according to my count) leading by about 2.5. But then my opponent played a tesuji I had not foreseen, and ended up catching a few of my stones and taking a big bite out of some of my territory. 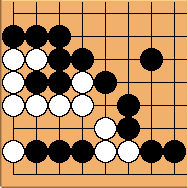 Well, actually, I had considered his move and thought I could defend it adequately -- but he played three or four tesuji in a row, the combination of which I hadn't foreseen. When it became clear to me that I couldn't defend adequately, I resigned, since it was clear that I had lost, and I didn't think there was much more that could be learned by finishing the game down to the last point. Not to mention that it would have just been painful. Taking a bigger perspective (what can I learn from this? ), this sort of thing seems to happen to me a lot, actually. I get to the end of a game and one (or several) of my territories has a weakness I hadn't seen. In this particular example, in retrospect, it's not too hard to understand -- the territory in question bulged way out into the middle of the board, and had a boundary composed of lots of small unconnected strings rather than a few, large, connected ones. So my opponent was able to make many strategic cuts -- any one of which, in isolation, I could easily have defended (which is why I hadn't bothered). But in combination they forced me into a position where I finally had to choose between saving two different groups. So, why does this happen to me? Areas of territory are mapped out, formed and reinforced over the course of the entire game. What exactly is it about my overall play that often results in territory with insecure, piecemeal borders, and how can I go about improving? Maybe it has something to do with shape? But I don't think I'm even sure what 'shape' really means, let alone being able to tell good shape from bad. Or perhaps another thing one could say is that I tend to leave lots of bad aji? Coyote : Cutting points close together are dangerous. Urgent moves before big moves. Yes, patching up a cut can be Gote and give your opponent a few points, but having territory cut up and destroyed utterly is worth more. The stones that I ordered came yesterday! And the board that I ordered is on its way too. Nothing fancy, just some official ING stones (in the hexagonal counting bowls) and a folding katsura board. I'm nowhere near good enough to invest a lot of money in good-quality equipment (even if I had a lot of money in the first place). But it's still very exciting since I've never before had my own equipment -- I've always played on other people's or online. I was playing white, and initially thought that my corner was perfectly safe. But the more I thought about it the more I was not sure at all. My current best guess is that it is seki. But there are so many variations and so much strangeness (the corner is REALLY WEIRD) that it's hard to know for sure. Guess I just need more experience and more study. (BTW I ended up resigning the game; even if this corner were alive I was still behind by 10 or 15 points). (Brent) Why is gote? White does not gain anything by playing so I don't think black has to defend after . (Jon) Well, it's two points. In some games that matters. Kirk: If black throws in at 4 after 2, it becomes just a two-step ko, instead of this longer ko here. 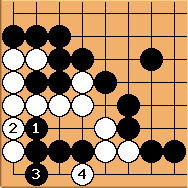 Kirk: If it's black to play, the key point to make seki is at 1. White must connect else black gets an eye and wins (EyesWinSemeais). Kirk: If black has a plethora of ko threats, he can play the two-step ko variation. Kirk: If it's white to play, he can force the seki, but not kill black. Brent: Thanks for the analysis! 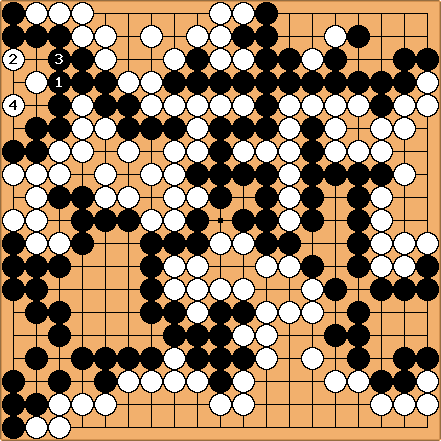 Last night I played a quick 19x19 game against GNU Go ("quick" as in, most of my moves I didn't think about for more than 20 seconds or so, with a few notable exceptions). I took a six-stone handicap. First of all, I should say that I was quite pleased with the result: throughout most of the game I was comfortably in the lead (by maybe 10 points or so). And this was version 3.5.10 of GNU Go playing at level 10, which is supposedly somewhere around 7 or 8k, I think. So that certainly speaks well of my rating -- I'm sure if I actually took the time to think more carefully about my moves I could do even better. ...capturing the four black stones in a snapback and leaving the other black group with only one eye. I think at lives in seki? But that still would have cost me the game. Is there a proper way to defend that kills the invading white stones? Or was I lost as soon as white invaded (i.e. should I have defended earlier)? Err..This is not seki!!! you have died. If you can't see this, think about it for a while. It is an eye in the stomach. In my reading, there is not any way to save your big dragon against white's invasion. So, you surely lost the game when GNU GO invaded into the upper-left corner. byorgey: Ah, I see now... if I don't play inside, white can make the eye and then capture; if I do play inside, white can almost fill to make either a farmer's hat or bulky five. Thanks!